Ervist was established in March of 1996 by a group of engineers that had experience working with ELERON, one of the biggest in the world Russian Governmental Scientific and Production entity.The first three years were crucial for shaping the company, as the groundwork for corporate strategy was made: initial business was installation of security systems for small and medium-sized companies – which evolved to bigger ones: Vympelcom (Beeline) telecommunications carrier with their offices, base stations; ROLF with their car sales offices and car maintenance facilities; Udarnitsa confectionary factory; various sites of Sheremetyevo Airport; installations of Mosenergo and Russian Railways. In total about 500 installations were serviced in the first three years. 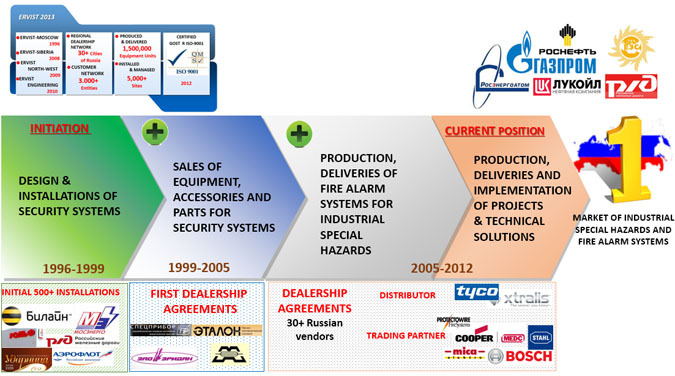 At around 1998 the company enters another market niche – trading of equipment, parts and materials for newly designed security systems; in 1999 a major shift happened – the business started focusing on production and deliveries of industrial special hazards and fire alarm systems – that gradually evolved into major area.